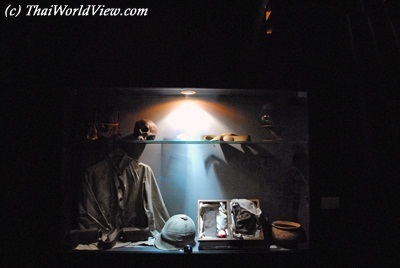 The Thai Film Archive or หอภาพยนตร์ (องค์การมหาชน) includes a Film Museum at the compound in Salaya. 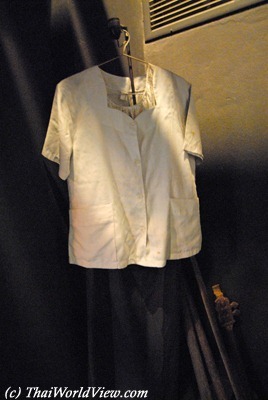 The Thai Film Museum features old clothes used in famous Thai movies. 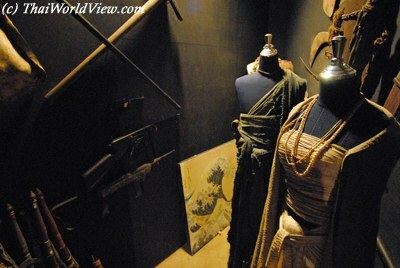 The Thai Film Museum includes old clothes and items used in popular Thai films. 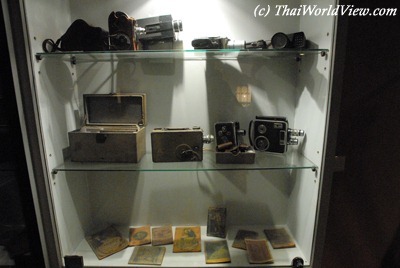 Those old items were used in decade 1960s Thai movies such as "Mae Nak Phra Khanong". 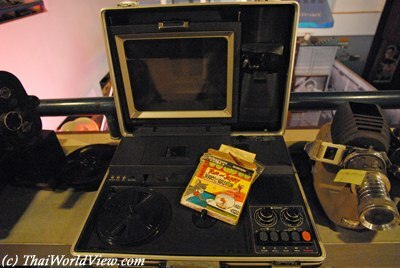 The Thai company Lepso has got a big bunch of old 16 mm films (not less than 50 titles). 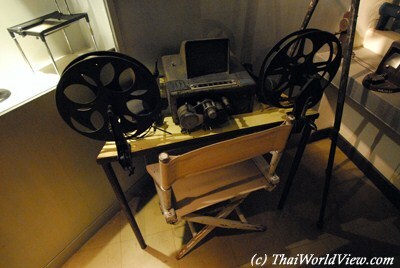 It is said they have much more than Thai Film Archive itself. Lepso released many underrated 16 mm films. It is really a great source to study the roots of Thai film. 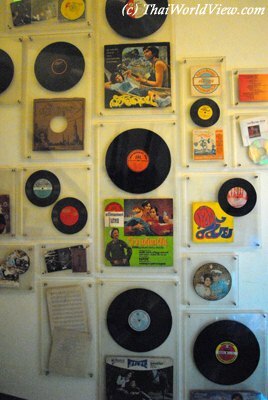 Old vinyl soundtrack records of Thai movies in decades 1960s-1970s. Thai Film Archive doesn't release so many old movies as they don't own the copyrights. 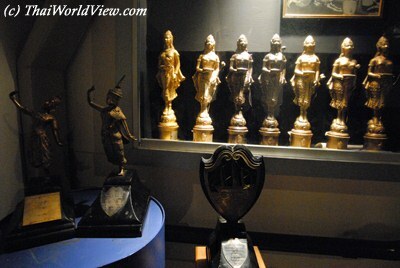 Golden statuette award (รางวัลตุ๊กตาทอง) given during the Thai yearly cinema awards. 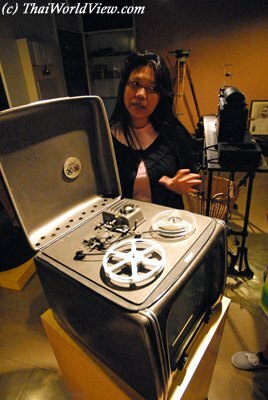 Thai Film Archive friendly staff explaining the different old items located in the Thai Film Museum. The first movies were in fact simulated by a fast image rotation. 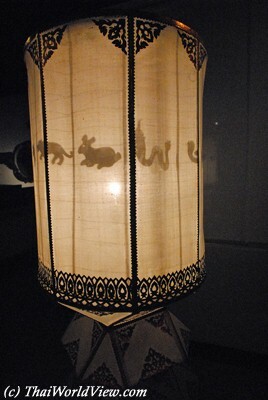 The images were drawn on a cloth stuck on a cylinder. Wax representation of Mitr Chaibancha before his deadly fall from an helicopter while filming movie "Insee Thong" in year 1970. 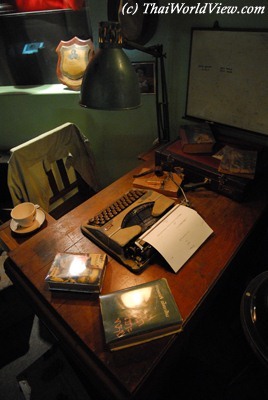 Visitors shall call ahead to visit the Film Archive museum. Generally they only give tours on Saturday, Sunday and public holidays. 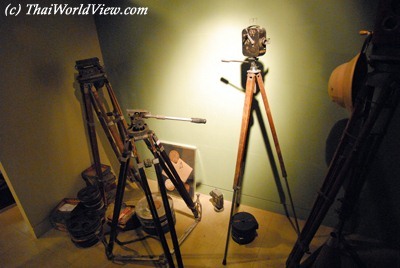 The Thai Film Museum includes many old cameras and weird projectors. 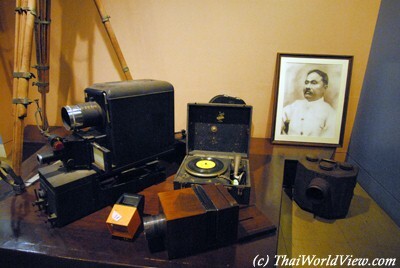 Thai Film Museum contains an old movie from King Rama V when he visited Europe in 19th century. 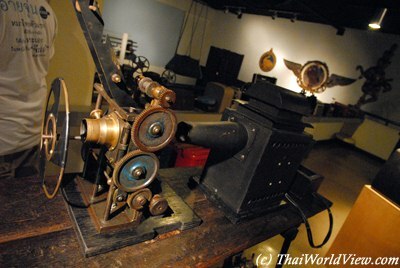 The Thai Film Archive started movies restoration in year 2005. Thanks to technology, it took 3 years to restore พระเจ้าช้างเผือก - King of White Elephant (1941) and เรือนแพ - Houseboat (1962). Thai Film Archive always checks to promote their activities, to get people to join and to use material there more. 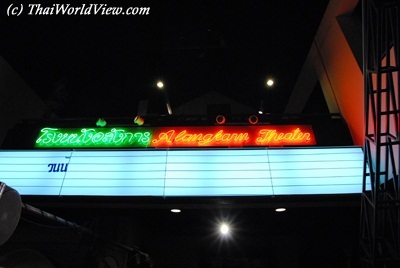 People can also watch old movies there. 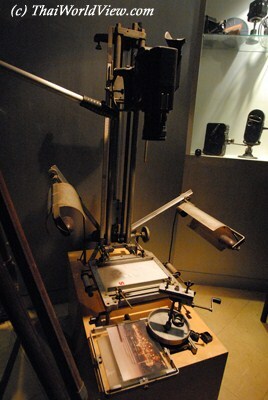 Thai Film Archive now has limited capacity to save and cure the old dying films. It needs a bigger hospital to treat those as national heritage. 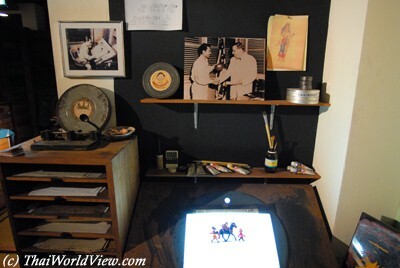 This old table allows watching movie reels and doing some sound mixing. Recently Thai Film Archive just rescued a few chapters of original old Thai film, King of White Elephants produced by Pridi, but the rest is lost. Ratana Pestonji didn't direct many movies and his 7 movies were not big successes at the box office. 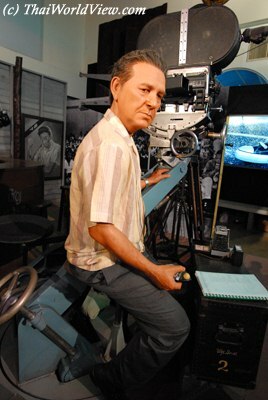 But all his movies reflect a good quality mixing suspense and humor so they have become classics. This scene is a reproduction of one Ratana Pestonji's famous sequence happening in movie โรงแรมนรก - Hellish Hotel (1957). 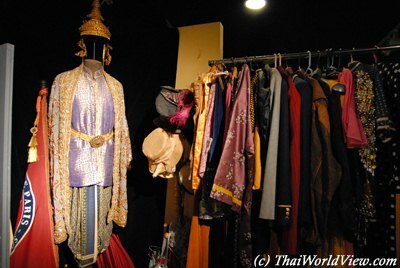 The Thai Film Museum includes old clothes used in famous Thai historical movies related to Siamese Kings. 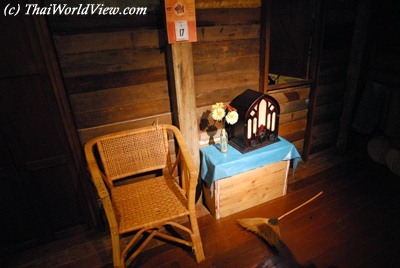 There is a special room related to the famous first Thai animation movie สุดสาคร - Sudsakorn (1979). Released in year 1979, Sudsakorn was the first and only Thai animated film until year 2006 when the movie Khan Kluay ก้านกล้วย was released. 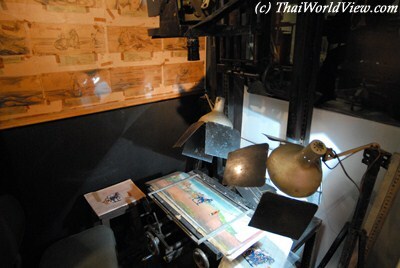 This is the room where animated director Payut Ngokrajang has done animated film Sudsakorn during three years and even damaged his eyes due to his hard work. This scene is a reproduction of one Ratana Pestonji's famous sequence happening in movie แพรดำ - Black Silk (1961). 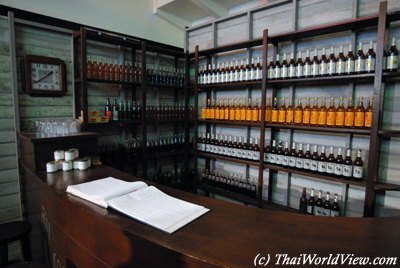 Workspace to perform old Thai movie under restoration work. 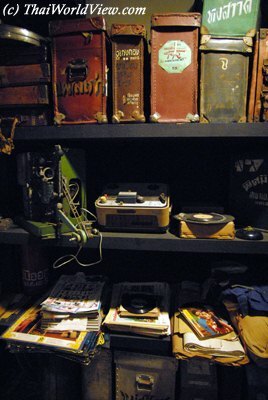 This storage room is including Thai movie reels put in old suitcases. 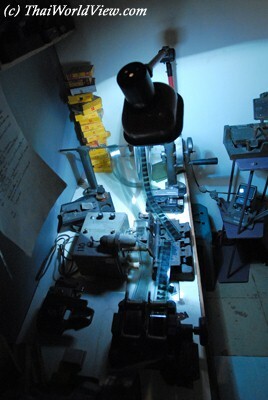 Many 16mm and 35mm old movies treasures can still be found at Thai Film Archive. 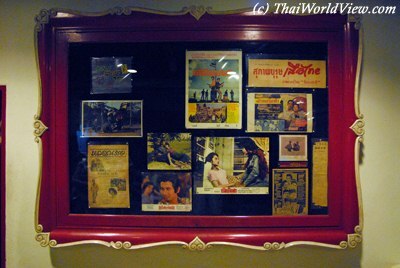 Frame with still pictures showing images of old Thai movies. Reconstitution of an old cinema theater with wood benches. 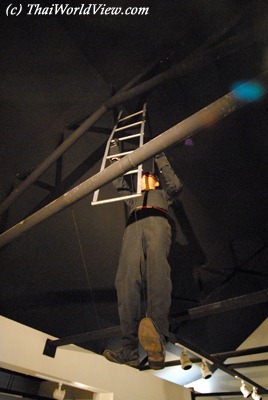 Projector can be seen at the back. Old Thai movies were dubbed live. 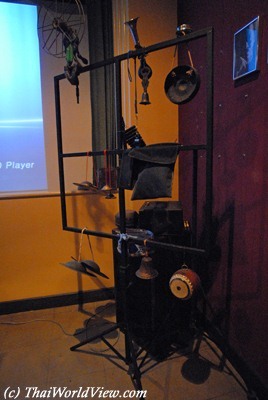 So those instruments were used to do noise and sounds during live projection. This room was reserved for dubbers. 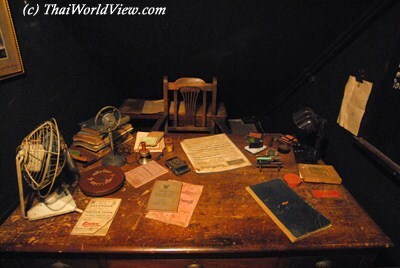 They would study the text and the movie story before the movie started. 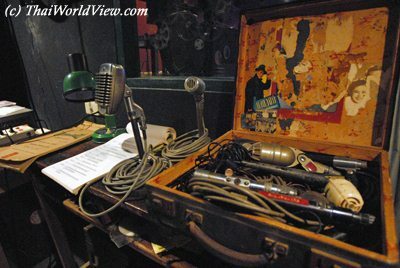 Old microphones used by live dubbers for 16mm Thai movies.